A pair of graded stakes-running turf horses will appear on the dirt next weekend at Belmont Park, vying for a berth in the Breeders' Cup Classic next month at Del Mar. 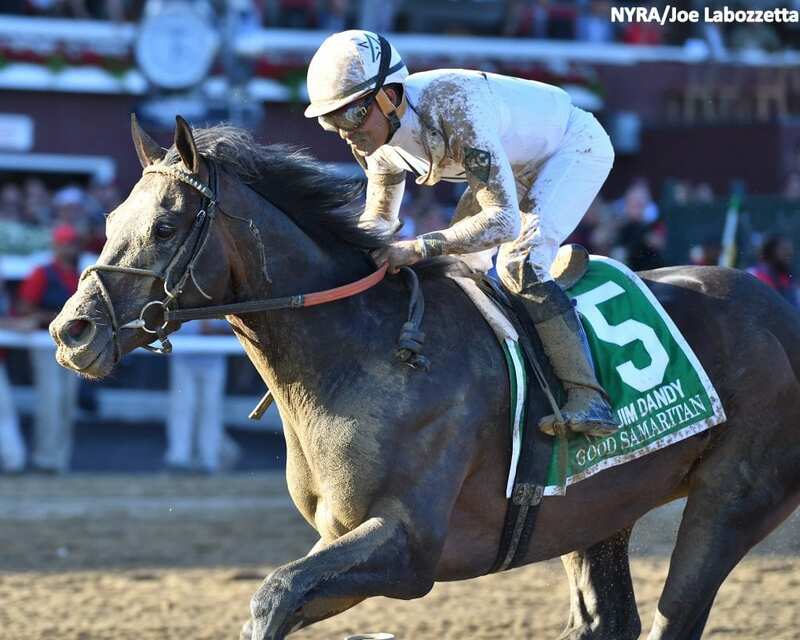 Good Samaritan has won a Grade 2 on both the turf and the dirt, while Highland Sky was second in last year's Grade 1 Belmont Derby; both are expected to enter the Grade 1, $750,000 Jockey Club Gold Cup this coming Saturday. Trainer Bill Mott plans to add blinkers on Good Samaritan for the 3-year-old's third dirt start, reports drf.com. The Harlan's Holiday colt made the transfer from turf to dirt with a big win in the G2 Jim Dandy Stakes, but in the G1 Travers, the colt was last of the 12-horse field in the early stages. Good Samaritan rallied to finish fifth behind West Coast that day, but Mott is hopeful that blinkers will help keep him more engaged early in the Gold Cup. Joel Rosario will ride Good Samaritan in the “Win and You're In” Gold Cup. Highland Sky, meanwhile, will be making his first start on the dirt for trainer Barclay Tagg. The 4-year-old son of Sky Mesa worked five furlongs on the dirt on Sunday at Belmont, and convinced jockey Rajiv Maragh and assistant trainer Robin Smullen to try him on the main track. In company with Tale of S'avall and Tale of Silence, Highland Sky sat behind his stablemates until the lane, then tipped out and passed both before the wire. Highland Sky was given a final time of 1:01.16, getting the final quarter in :23.85. Others expected for the Jockey Club Gold Cup include Keen Ice (Pletcher), winner of the G2 Suburban and second to Gun Runner in the Whitney; Destin (Pletcher), 2016 Belmont Stakes runner-up and recent allowance winner; Rally Cry (Pletcher), runner-up in the G1 Woodward last out; the Rick Violette-trained Diversify, a multiple stakes-winning New York-bred; and Doug O'Neill trainee Pavel, impressive sophomore winner of the G3 Smarty Jones Stakes. This entry was posted in Breeders' Cup, NL List and tagged Barclay Tagg, belmont, belmont park, bill mott, Breeders' Cup, breeders' cup classic, destin, diversify, good samaritan, Harlan's Holiday, highland sky, jockey club gold cup, joel rosario, keen ice, pavel, Rajiv Maragh, rally cry, sky mesa, win and you're in by Paulick Report Staff. Bookmark the permalink.